The current issue of Knit Now magazine (issue 70) came out last Thursday and features my latest design, Sunday Brunch. 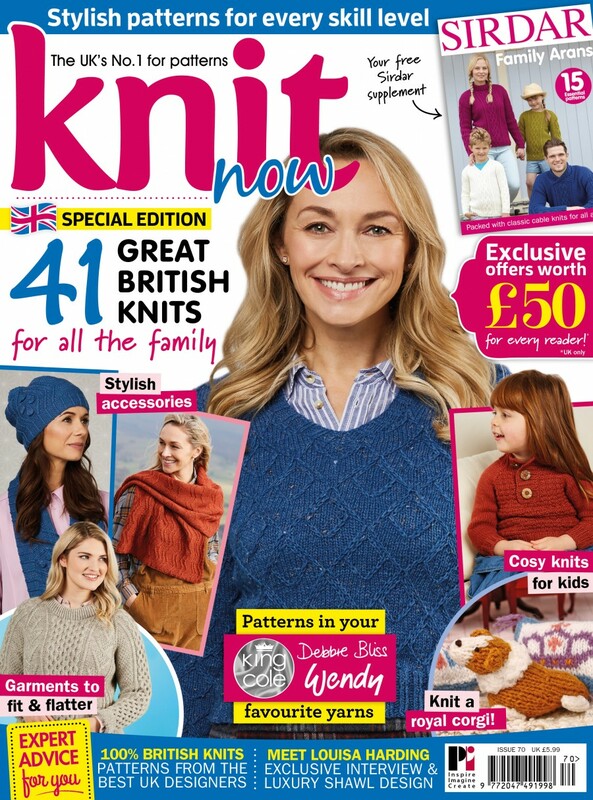 Knit Now issue 70. Image copyright Practical Publishing. Sunday Brunch is a baby sweater knitted in the round from the top down featuring a waffle stitch pattern on the front and back, with a placket that is excellent for showing off some special buttons. The jumper is designed to be loose-fitting, with 7.5 cm positive ease; this gives the jumper a casual fit, and plenty of growing room. The jumper's name, Sunday Brunch, is inspired by the waffle stitch pattern, which reminded me of edible waffles, which are perfect for a leisurely Sunday Brunch! Sunday Brunch. Image copyright Practical Publishing. The sample is knitted in West Yorkshire Spinners Aire Valley Aran, which is a British wool-nylon blend yarn. The yarn is an excellent workhorse yarn, is excellent value for money and is very hard-wearing. Aire Valley Aran comes in a wide variety of colours, from traditional arans to bright shades, so there should be something for everyone. 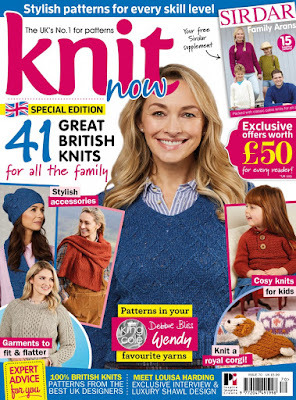 Issue 70 of Knit Now is the Best of British issue, featuring designs by British (and British-based) designers knitted in British yarns. I love Ruth Garcia-Alcantund's Orchid Ombre socks, knitted in The Knitting Goddess Hand Dyed Colour Wheel Britsock, and the Fieldfare Scarf and Mitts by Miranda Jollie. The magazine is on sale now in newsagents and supermarkets, or can be purchased online, either in print or digitally. Orchid Ombre Socks by Ruth Garcia-Alacantund. Image copyright Practical Publishing. Fieldfare Scarf and Mitts by Miranda Jollie. Image copyright Practical Publishing.